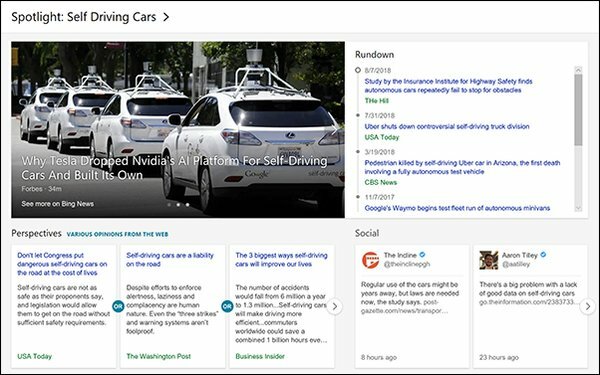 Bing on Monday released a feature that curates articles on a specific topic to show how the news story has progressed over time. The search engine’s intelligent spotlight feature uses artificial intelligence and human editors to provide details on the latest headlines and relevant social media posts. The news articles will appear in a Spotlight, a carousel of the latest headlines related to the news story. Spotlight provides a summary of diverse perspectives on the topic from across the web to help readers better understand, and provides a way to click on the answer to get more in-depth coverage. Deep-learning algorithms and web graphs for hundreds of millions of web sites in the Bing index identify top sources for national news. Various signals monitored include queries and browser logs, and document signals from publishers such as how many publishers cover a story, their angles, and how prominently they feature the story on their site. The perspectives module, used for controversial topics, will show different viewpoints from known sources that the search engine defines as “high quality.” This type of source must meet Bing News PubHub Guidelines, a set of criteria that favors originality, readability, newsworthiness, and transparency. Based on Bing's new criteria, publishers may want to consider new business models that lean toward the Spotlight requirements. Sites that meet the requirements are more likely to be included in the Bing news index. The articles must identify sources and authors, provide attribution and demonstrate sound journalistic practices such as accurate labeling of opinion and commentary. The Spotlight feature is available on Bing desktop and the mobile web in the U.S.